ForkliftAccessories offers all the forklift attachments you need to get the most out of this essential piece of industrial equipment. Many of these attachments are designed to be used in conjunction with your forklift forks, while others include safety, ergonomic and other attachments that improve safety and performance. Forklift attachments are designed to be added to standard forks include a variety of fork extensions and fork covers that increase their efficiency. Steel forklift extensions easily slide on to your existing forks, adding an extra measure of safety by stabilizing large loads, while polyethelyne fork covers are designed to protect loads from damage. A low cost forklift boom or telescoping boom virtually change your forklift into a compact crane. These low cost forklift attachments are so useful, they practically pay for themselves the first time you use them, performing jobs you otherwise would have to lease or buy a crane to carry out. Forklift drum attachments are available that make handling unwieldy drums easy. These products fit onto the forks and feature and automatic gripping device. They eliminate the need for manual handling of drums, which is not only inefficient but very unsafe. When not in use, drum handling attachments take up less warehouse space than many other types of drum handling equipment. 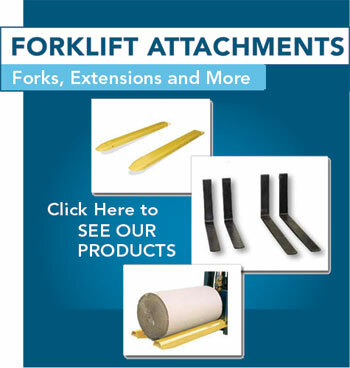 These are just a few examples of attachments available from Forklift Accessories. You will find many more throughout our catalog. If there is something you need, but cannot find in the catalog, contact us via email or phone and a company representative will be able to help you locate it. If it's a new forklift, warehouse supplies or any other materials handling equipment or supplies you're looking for, check out the website of our parent company, Bahrns Equipment Inc. For over 45 years, Bahrns has been serving the warehousing and industrial needs of central Illinois from their headquarters in Effingham IL. Everything you see here on forkliftaccessories.com is backed up by the Bahrns commitment to service, quality and value, so whether it's attachments, accessories or parts you need, you know you are in good hands.